The comforts of home on vacation. Spread out in this large 4-bedroom home in scenic Truro. Located at the end of a private road, a five-minute walk brings you to a serene Ryder Beach. 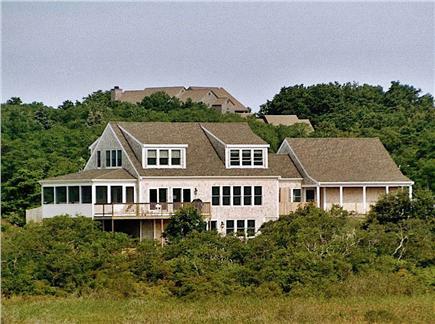 The home has a sweeping, unobstructed view of Cape Cod Bay and conservation lands. The kitchen, dining room, living room, screened porch, open porch, master and queen bedroom all face this beautiful view, as does the signature outdoor shower. 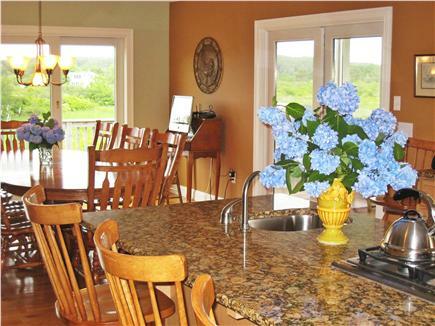 Chef’s granite kitchen has state-of-the-art appliances, huge island with barstools and bar sink. High-Speed Internet, Wi-Fi, cable television, unlimited 48-state long distance, utilities, and end-of-week housekeeping all included in rental price. 2-car garage, laundry room. 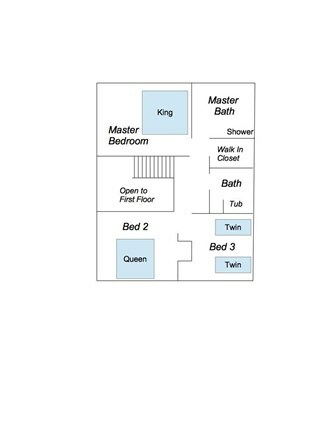 Master suite has king-sized bed, enormous, private bath and walk-in closet. 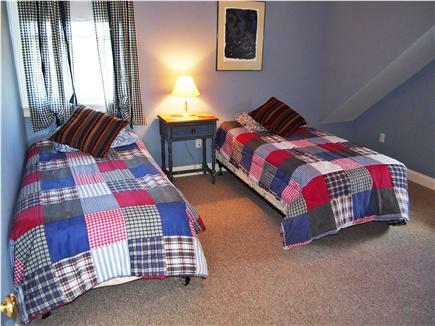 2nd and 3rd bedrooms have queen-sized beds, and 4th bedroom has 2 twin beds. Easiest possible transition from beach to house – outdoor shower adjoins the front door, which opens to a “sand” (not “mud”) room loaded with large closets for beach chairs, umbrellas, coolers, etc. Beach towels, chairs and umbrella supplied. House worked out perfectly for us! Had a number of family visiting at different times and house was laid out well for multiple folks. House was spotless, well-applianced and bright. Kitchen and dining area very open, comfortable and easy for all of us to be there together. 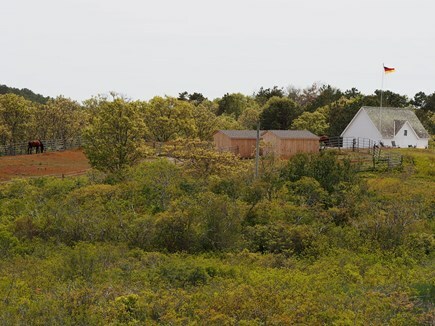 But the highlight of the house was the screened in porch in the morning and evening, listening and watching the bird activity over the marshes!! 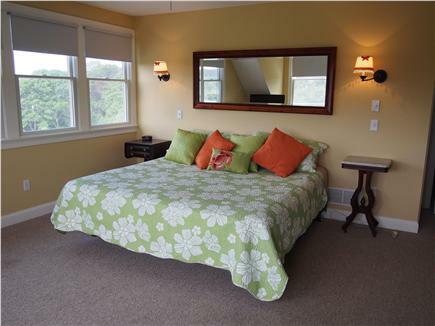 Peaceful, close to beach and to Truro and Wellfleet. A perfect family week spent in the ideal home. Absolutely NOTHING was missing -- close to the beach, lovely summer breezes, home outfitted with every possible amenity for a worry-free holiday. The transaction was incredibly easy and the owner was a pleasure to deal with. We loved the quick walk to Ryder Beach for a dip in the bay, a rainy day stroll to the Hopper house, or a sunset frolic with the goats who live nearby (!) as well as the easy drive (under Route 6) to Ballston Beach for big waves and those phenomenal outer Cape dunes. Dinner in Wellfleet or Provincetown is an easy drive in either direction, but the gorgeous screened porch provided the best nightlife we had. The house comes with a thorough instruction manual; fast, reliable wi-fi; and a fun basement playroom. Jane was reachable and totally responsive to questions along the way. The first floor bedroom is perfect for grandparent(s), and if your kids are young, Ryder Beach is exactly what you want: warm, calm water that's swimmable even at dead low tide. We saw more butterflies than we could count around the house, and had fun looking for crabs, minnows and shells when low tide exposed dozens of sandbars. On a couple of days we were the only people in sight in either direction on the public beach! Another great vacation at the Truro house! You could not ask for a better location. We go to the bay beach and ocean beach and we are close to both. We enjoyed the screened porch every evening as did the children. We look forward to returning next year. This was our 4th summer in the McConnell home, a beautiful place that is very clean and comfortable. The kitchen is huge and perfect for the gourmet cooks in my family. 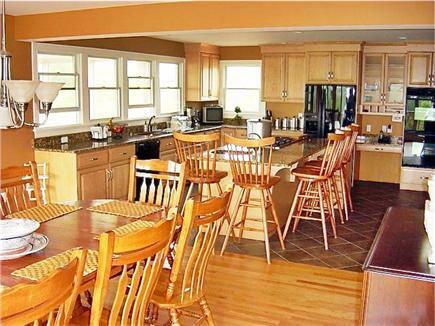 The counter and large dining table make it easy to entertain a large group. The screened in porch is one of our favorite spots to hang out. It is quiet and though there is a house next door, it feels very private with an unobstructed view of a meadow, horses in the distance and a slight view of the water. The owners are lovely and will try to accommodate your needs to ensure you have a wonderful vacation, like providing sheets and bath/beach towels. Just completed our fourth stay at this most comfortable home. 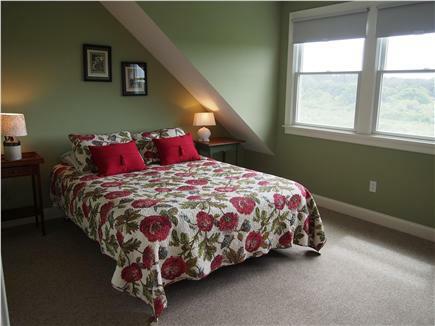 Located in a quiet and convenient location in Truro. A short walk to the Ryder bay side beach, a calm tranquil location to walk along and share with small children. And, a short drive to several great ocean side beaches better suited to the more active swimmers. The home is always neat and clean upon arrival with a kitchen suited for those with a gourmet flare. Love this home! Our three-generation family group thoroughly enjoyed staying in this spacious, comfortable, well-furnished, and well-supplied home. We appreciated the privacy and convenience afforded by the arrangement of the four bedrooms and three bathrooms, as well as the number and size of common areas where we could enjoy time together. The screened porch was a favorite with all. The extra comfort of central a/c on a few muggy afternoons and nights was much appreciated. The location and views are magical -- marsh and meadow, farm with horses, and a glimmer of water. Nearby Ryder Beach is never over-crowded and is perfect for swimming and toddlers. A sandbar at low tide one day provided a memorable adventure for the kids. The thoughtful owners left a few extras, including beach toys; and were easy to reach with questions or minor problems. We already appreciated all the attractions of this beautiful area, having vacationed in the vicinity for many years; we were thrilled that the house itself is now one of the attractions which will keep us coming back. 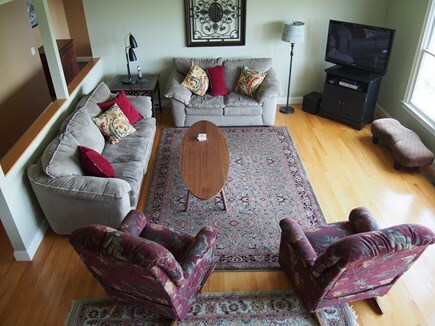 As a family of six adults, we needed a house where there was plenty of room to spread out. This house fit the bill! 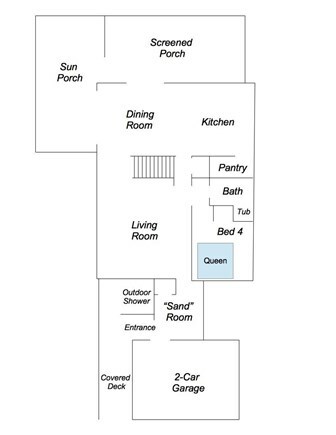 Beautiful open kitchen, lovely master bedroom and bath, and both a screen porch and deck to relax on. From the porch and deck, you could see the bay and the dunes - so pretty. Short walk to a nice, uncrowded bay beach, and great roads for riding a bike. Owners very easy to communicate with.